An Egyptian-style sphinx has been excavated… from the sands of Guadalupe, California, U.S. 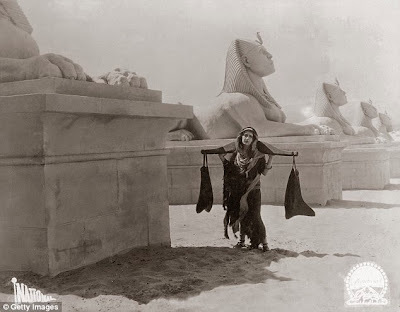 It is one of 21 that flanked the set of Cecil B DeMille's 1923 silent film "The Ten Commandments" (not the 1956 remake with Charlton Heston as Moses). After 90 years beneath the dunes, the sphinx needed special handling, which was good practice for the archaeology volunteers. To keep the paper-thin plaster of Paris from cracking, they wrapped it in cheesecloth soaked in a preservative chemical; funneled the sand out of the hollow statue and replaced it with expanding insulation foam; and allowed it to dry and shrink to its normal size (IMAGES HERE). That normal size of 15' (4.6 m) tall was dwarfed by the 12-story set. Executive director of the Guadalupe-Nipomo Dunes Center Doug Jenzen, who oversaw the excavation, explains that in the era before special effects, the movie required constructing one of the largest sets ever made: "...anything that they wanted to look large, they had to build large."